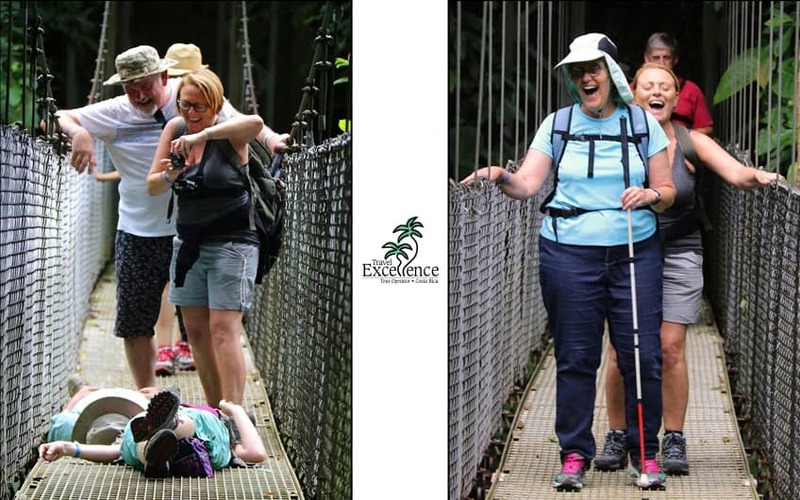 Last week I was taking a cup of coffee with a colleague when the conversation turned into something that totally captivated my attention: Travel Excellence, a well-known travel agency in Costa Rica, held a full tour operation for a group of visually impaired people, and, as I heard, it was a total success! I finish my coffee and automatically decided to investigate how it was, and how the tour leader and the guide managed this group during their stay in Costa Rica. To be honest, I was a little bit surprised about that, because I had never heard anything like that occurring here. After thinking a little bit how to present my demand to the agency, I called them and talked with the General Manager of the company, Mr. Modesto Blanco. He gently offered me an interview with him, and also with the guide who operated the group, just to know better how Travel Excellence offered this kind of services. The conversation with Mr. Blanco went animatedly through the main principles of the company and their philosophy. Travel Excellence is a very organized enterprise, with a very clear vision and determined objectives. To offer a unique experience in the country and exceed their customer’s expectations is one of the main focus of this increasingly tour operator. Then was my turn to speak with Mr. Giovanny Madrigal, the assigned guide for the group. I was really expectant of what he would say during the interview. I had a lot of questions for Giovanny –as he preferred to be called-, due to the fact that it seems like managing a group of people with visual difficulties can’t be an easy job. Or, at least, that was my thinking before talking to him. First of all, he told me that when he confirm his availability to guide this tour he hadn’t idea of the physical impairment of the participants; so, when he found out this he went a little bit anxious, cause he was worried about how he would deal and guide a group of people who can’t see well, all by himself. But, these worries disappeared soon. He was given with a sort of manual provided by Traveleyes International from United Kingdom, the wholesaler responsible for this group, in which were very well explained how they operate. That gave Giovanny the opportunity to learn more about the people he would meet. And that let him be really excited about this big challenge for his personal career. And that let him be really excited about this big challenge for his personal career. Just to know a little bit about that company, I searched a lot more about them and I have to say that what I found about them was really amazing for me. They don’t offer ordinary group holidays… not at all! Traveleyes operate its groups as a mixture of both sighted and blind travelers. For the sighted travelers they just ask them to be companions of the blind ones, and to share their sight by describing and telling them the world’s wonders they experience during the trip. Companions don’t need to have any kind of experience in blindness, and something interesting is that they subsidize the 50% of the cost of their holiday. Also, as visually impaired travelers, there exists the possibility of book a travel by themselves, as well as travel alone if they prefer. Fostering a great sense of independence and freedom for them. The group’s integration is amazing and both, blind and sighted, enjoy a lot the journey and create a profound bond that goes beyond the senses… As I noted after this interview. I truly liked this kind of modality I had not heard before. The group was composed by 17 people in total. Seven of them were visually impaired persons, each one of them with a personal companion in charge of be supporting him or her during their adventure in Costa Rica. The other one was the tour leader in charge of the group, Mr. Andy Wilson, a great support for Giovanny during the whole trip, as he told me. As a guide, Madrigal describes this experience as an unforgettable one. The group was very open minded and willing to experience new things, which facilitated a lot the job of the ones in charge, and also let them live a really great experience during their vacations in Costa Rica. Since the very beginning, the energy of the group was very great, a factor that totally contributed to the success of the trip. The group was very diverse, the range of ages went from the early twenties to the 60’s approximately. But, it doesn’t mattered which age had every single participant: each one added some special energy to the group. 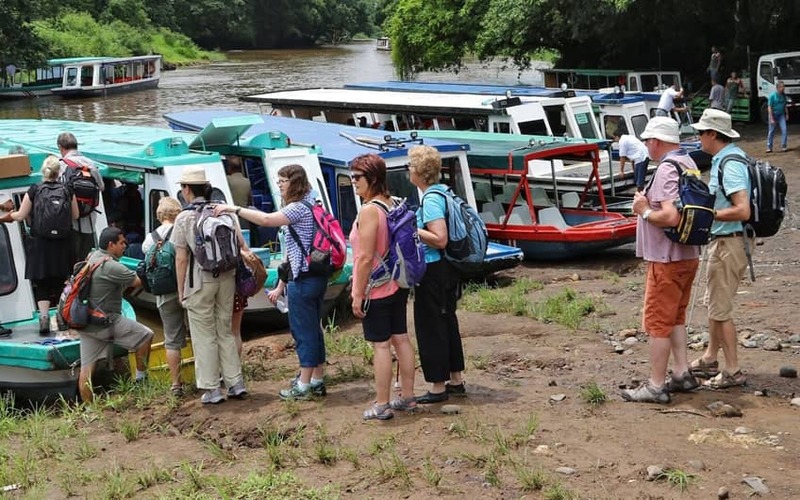 Once the itinerary started they spent their first night in San José, just to had an early departure next day to visit the Tortuguero National Park. Here, they lived a great experience doing the boat tour through the canals. This was Giovanny’s very first time guiding people with visual difficulties, so for him it was as well a great challenge. 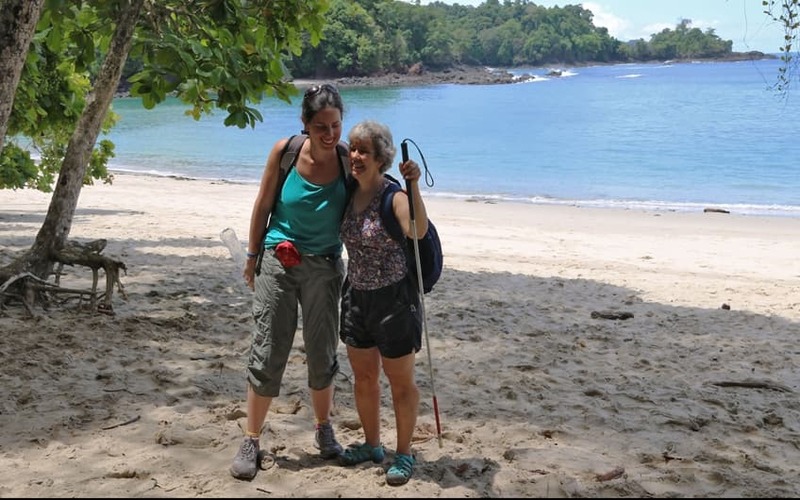 During their stay in the beach, specifically at Manuel Antonio National Park, something similar to the rainforest experience happened. For the guide it was a rich experience to see them enjoying and discovering their surrounding just by being quiet and letting their senses be delighted by what was going on around them. 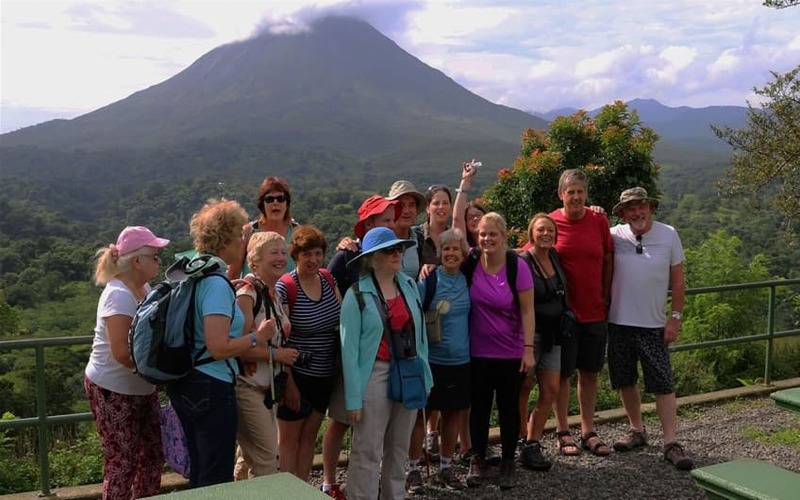 They visited other regions of the country, as Arenal Volcano & National Park, where they had the opportunity to live the Mistico Hanging Bridges, other different rainforest experience in which they have to be confident and walk along the forest on the suspension bridges. But, if you are now thinking about how brave they were, I have to tell you something that took me by surprise and that I know it will amaze you too… they also did the zip line canopy tour and the tubbing tour in the river! Can you imagine! I urged Giovanny to tell me how was the preparation for the tour, how was the response of the group, their feelings… everything! This particular topic made me be particularly interested. Before talking with Giovanny I could not imagine how visually impaired people could be adventurous and courageous enough to accept the challenge of being involved in adventure activities like those. Then, I totally understood how; and that made me valuate a lot more the way they embrace life. For the canopy company it was a brand new experience, as they never held an operation like that one before. All the canopy guides were as excited as the participants, and that created a great climate for the development of the activity. Their own companions were always very supportive, giving them confidence and explaining all the steps of the tour too. The tubbing was also a fun and challenging adventure for them. 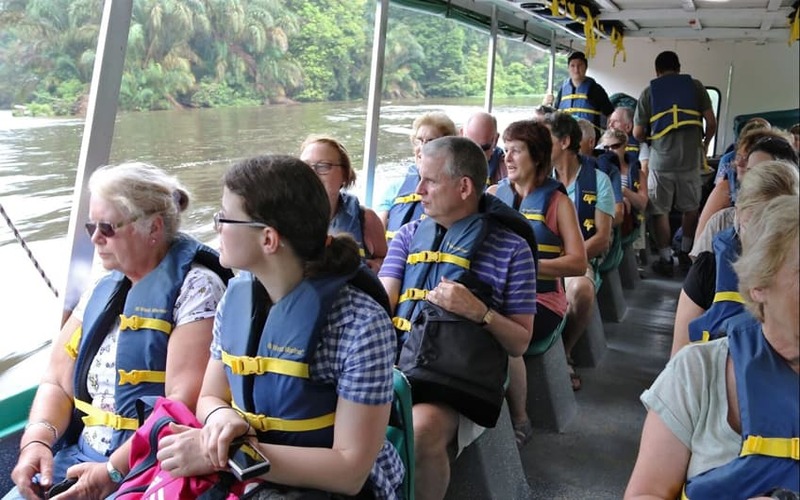 This tour consists in going down the river in personal rafts (yes, you here it well, completely individual rafts) enjoying the flow of the river below them and all the majestic sounds of the nature in the surroundings. They were alone when crossing the river, and I think that this allowed a richer personal introspection for them. As said by Giovanny, the richness of this experience for him was the fact of seeing how this people were stepping out of their comfort zone to try new things; just to truly live a lifetime vacation in Costa Rica. Based on their comments and their evaluation forms, Madrigal says that he knows the group had a blast and that Travel Excellence totally exceeded their expectations, as their ground tour operator. And, what about the guide’s experience? He describes this challenge as probably one of the best tours and one of the best groups that he ever had during his years as a guide. Giovanny says that he thanked them a lot, because all the days sharing with them and living the passion for tourism were a reminding of the reasons that made him become a tour guide. A real growing experience that he will never forget. Now, I can understand why the partners of the company chose this phrase to represent them. And I completely agree with them. The experiences offered by Travel Excellence’s team are something that transcend people’s senses and expectations, and this is the reason why they could not have picked a better slogan for this great company. Now it is totally well-proven!